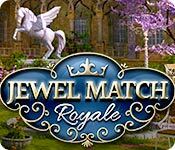 Jewel Match Royale is rated 3.7 out of 5 by 21. Rated 5 out of 5 by SparkleGlow100 from My very favorite match 3! I completely love this game. Just everything about it: the backgrounds, the sounds of birds and water, the match-3 icons, the variety of ways in which you can play the game (timed, limited-moves or relaxed), the explosions, the power-ups you can buy, the multi-screens you must tackle sometimes up to 4, to get past one stage, the bonus "garden" game of match-3, and the mahong if you need to earn extra bags of gold coins. I know there are other jewel-match games, but this one is just the best!! Rated 5 out of 5 by bigred11102 from great game great gme if it will let me play again ?????? 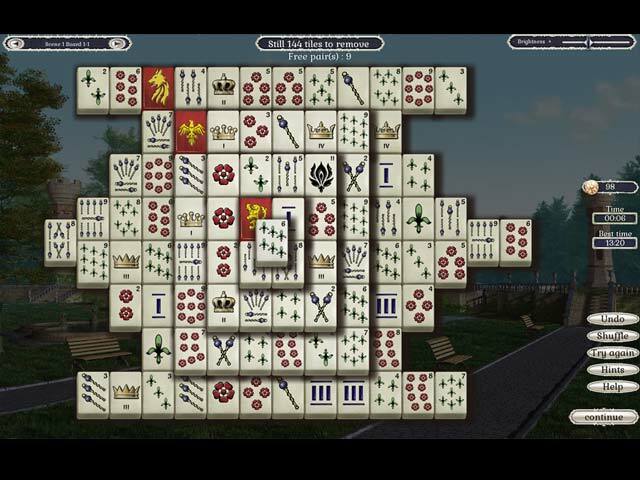 Rated 5 out of 5 by dontwannaknow from Very nice It's not your typical match game. There are numerous levels and of course they get more difficult with each level but you also get more extra's (gold/silver/spells-etc) the higher you go. One of the best things is if you get bored with one board; several are available for play. Not to mention other bonus games (1 is a mahjong board) and the flower garden games. No way you'll get bored. Nice soft music in the background & graphics (extra goodies- etc.) are cool too. I would recommend to anyone. Even at full price; worth it. Rated 5 out of 5 by bessiegirl from Another good one I have all the jewel match series and always wait for a new one to come out. These are the best match 3 games I've ever played. Level difficulty which you can use, beautiful castles to build, new challenges on each level...just an all around fun game to play. I play on the move limit level and find it challenging but not frustrating...that is if you keep a good stock of power-ups on hand. Unfortunately, the power-ups do not last level to level which creates the need for strategy, especially as you advance in the game. You accrue "money" during each level to buy power-ups. Love these games. I always turn off the music but voice-overs, and other sounds are quite pleasant. I just skipped the cut-scenes, but there is a story to the game if you like those additions. Graphics and animations are amazing. Rated 5 out of 5 by marg6043 from Stunning game This game is the best of all, I love the twilight also, the many rooms, levels and the best of all the bonus games is to keep any player busy for hours. I love the CE and will not have anything else. Can no wait for more to come and I hope is very soon. Rated 5 out of 5 by Capri66 from A Royale Game I really enjoy the Jewel Match games. This one is another great addition to the series. Royale comes with nice storyline. A lot of things to do and it contains a fully featured Mah Jong game. Beautiful art and relaxing music. Rated 5 out of 5 by rule62 from Favorite Jewel Match game This is my favorite Jewel Match game -- which is saying something as I really enjoyed several of them. :) The graphics are great, and the music is above par. The story line is nothing to write home about, but it's okay and helps move things along. No doubt everyone has their favorite way to play. Personally I like to limit myself to the 1st bomb blast available, and use that and the largest hammer. In any event, great game! Rated 5 out of 5 by pennmom36 from I Couldn't Justify The Collector's Edition Price So I'm Glad The SE Has Finally Arrived! Jewel Match games are quickly becoming my favorite Match 3 games, (but I'm still addicted to the Cradle of Rome series) and this one has such an interesting story!. The graphics are stunning in all of the Jewel match games, but I'm not as impressed with the graphics or tile selections, offered in Royale. Compared to the last seasonal Jewel Match games, Snowscapes and Twilight, there is a vast difference in my opinion. The good news is that all of the games in this series has so much to do that it's extremely entertaining, and never boring, especially once you start to advance to the higher levels. You can play on a Timed Mode, a Limited Moves Mode or a Relaxed Mode, and this game is designed to be compatable with touchscreen computers as well. Each level has several "rooms" to complete, when one room is cleared, you click on the arrows to visit the next room. If you have time remaining after completing a level, you can either continue or go to the previous room and search for bonus items. I don't know of any other Match 3 that has this feature. The coins and amulets you earn are used to build your castle estate, which can be set at anytime as your wallpaper. Stars are used to purchase extra's for your castle such as trees or decorations. Matches of 4 will earn you a Rainbow tile that can be matched with any tiles, matches of 5 tiles or more awards you with a Royal Arrow that clears rows, columns and diagonal lines. The object is to clear all gold cells by making matches over the gold cells. 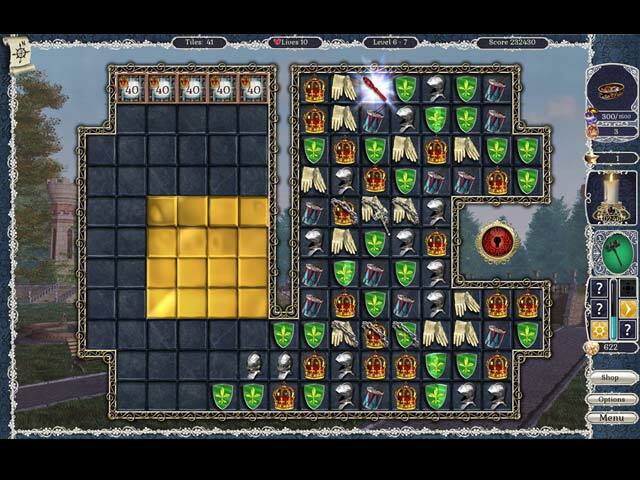 Some items require you to make matches under the items such as keys or amulets until they fall off the board. Coins that appear can be clicked on but they will disappear eventually, and bags of coins must be dropped off the board. 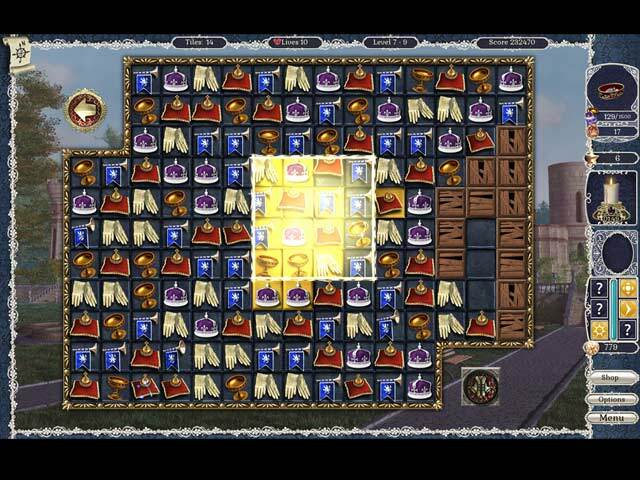 Some tiles are blocked with crates, chains, double chains, ice, or dark fog, requiring matches next to them or of the same type of tile contained within. There are Safe Tiles that require a specific number of matches to break as displayed inside. You earn a new life every 50,000 points and are given the option to use one of your lives for extra time shortly before the timer runs out. This is a fantastic Match 3 game, with a fantastic storyline, and even better now that it's available in the SE, enjoy! Rated 5 out of 5 by jap54 from Jewel Match Royale Played the collectors Edition but will certainly be purchasing this game, more entertaining that the normal match 3 type game and really enjoyable and challenging. Did not have enough credits at time to purchase Collectors Edition but may consider this for future. Rated 4 out of 5 by caseymom from BE STILL I like this type of game but in Arkansas we have an old saying..."if it ain't broke, don't fix it". The moving scenes are very irritating and the game is better without that. Go back to the screens that don't move and make them like last one I bought.... Also, let me decide what I want to purchase with my stars and money and when I want to purchase them. But the main complaint.....moving scenes. Yuk! I still bought the game because I like these that have the relaxed mode too.